What a year 2011 was for Harry Potter fans! Even though the release of the last Harry Potter book was four years ago, J.K. Rowling still managed to heat-up the headlines, especially through the summer. Harry Potter and the Deathly Hallows, part 2, released at midnight on July 15 to excited audiences in the U.S. and U.K.. Fans were both eager to see this final film of the beloved franchise, and also reluctant to witness the end. For many, as came to be said time and time again, Harry Potter had been their childhood...and they held on to savor those last thrilling moments. 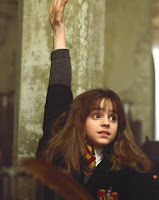 But, one month earlier, on June 15, JK Rowling had promised her fans a new treat to come -- Pottermore! By the middle of July, no one was sure exactly what Pottermore was, but the anticipation of new material from Jo had lifted everyone's spirits and incited a massive online search for clues. The thrill of the hunt which had kept fans fervent from one Potter book to the next was renewed as readers tried to guess exactly what Jo had up her magical sleeve this time around. 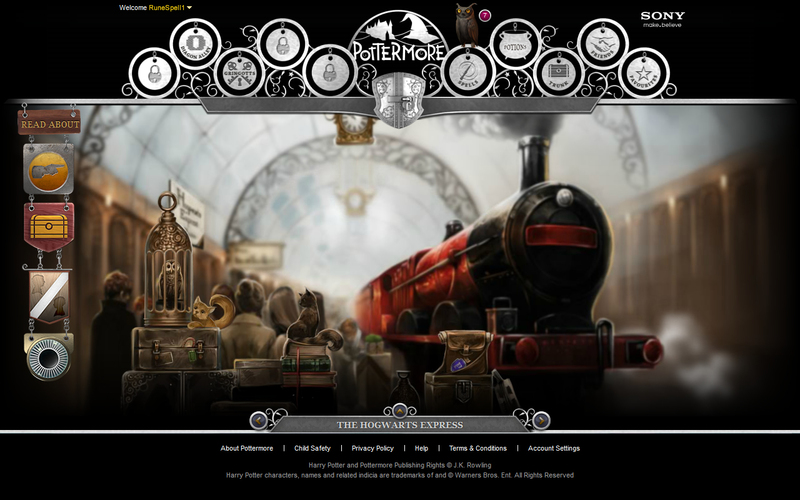 When Pottermore opened on July 31 to Beta registration with 7 days of the Quill Quest Challenge, the internet (and this blog!) went wild. Fans were frenzied to catch their quill and ensure their early entrance into Pottermore. The Pottermore pearly gates were supposed to open to one and all in October, but, alas, beta testing has continued, the craze has died down, and now fans are waiting and hoping to hear from JK Rowling when and WHAT her next release will be. Honestly, after what Jo said at the Deathly Hallows premiere about having multiple books ready to go, I had thought we'd be gifted with an announcement regarding a new release around Christmas. But if I may be so bold as to make a Trelawney prediction, I do believe we'll hear of her next release in the next three months -- perhaps as a Valentine's treat! In life, mirrors reflect reality rather sharply and, to some POVs, unforgivingly. In fiction, especially fantasy, mirrors may take on a magical quality and provide insight into the subjects they reflect, or show people and action beyond its borders, such as the mirror in Snow White. However reflections also serve as a literary device. By mirroring a later action or scene against an earlier one, the author can, through differentiation, show character growth, deepening conflict, or earned triumph. 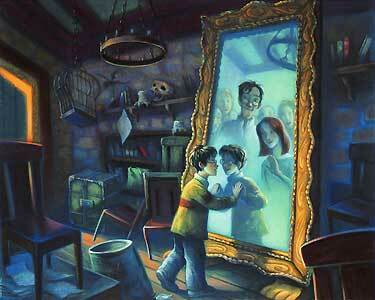 J.K. Rowling works frequently with mirrors both as a thematic image as well as scenic reflections. 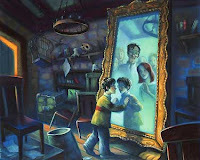 From the emulation of a heart's true desire in the Mirror of Erised at the beginning of her saga, to the providential eye of Aberforth Dumbledore watching over the Trio through the broken mirror, mirrored scenes provide the reader greater understanding through deepening perceptions and contrasts. Perhaps one of the most striking mirrored devices is the framing of the series itself. Have you ever noticed that the last half of the series reflects the first with Goblet of Fire as the pivot-hinge? When you look at the series from this vantage point, Order of the Phoenix reflects Prisoner of Azkaban, Half-Blood Prince reflects Chamber of Secrets, and Deathly Hallows reflects Philosopher's/Sorcerer's Stone. In Prisoner of Azkaban, Sirius Black is introduced as a murderous escaped prisoner intent on harming Harry and almost loses his soul. In Order of the Phoenix, Sirius is the loving godfather, imprisoned in his own home, who saves Harry and loses his life. In Chamber of Secrets, the mysterious Tom Riddle is introduced. Through Riddle's diary, Harry explores his past at Hogwarts -- but through a web of lies as Voldemort's soul presents it. A monster is set lose in the castle, and innocent students are petrified. In Half Blood Prince, Harry and Dumbledore together explore Voldemort's past through the truthful reflections of the Pensieve (itself a mirror-like object). In the end, the monstrous Death Eaters are set lose inside Hogwarts, and Dumbledore is killed defending his students. As I'm running around getting ready for Christmas in North Carolina, I can't help but think about the wonderful, snow-covered Christmases Harry spent at Hogwarts or with Sirius and the Weasley family. With each book, J.K. Rowling seemed to delight in crafting something special for two specific holidays. With Halloween usually came something appropriately spooky -- like trolls in the dungeon, or a Death-Day Party. But with Christmas came a Great Hall full of decorated trees, presents from Harry's new and expanding "family," and often new clues for the developing mystery. Here's some of my favorite tidbits from each of the Harry Potter Christmases. 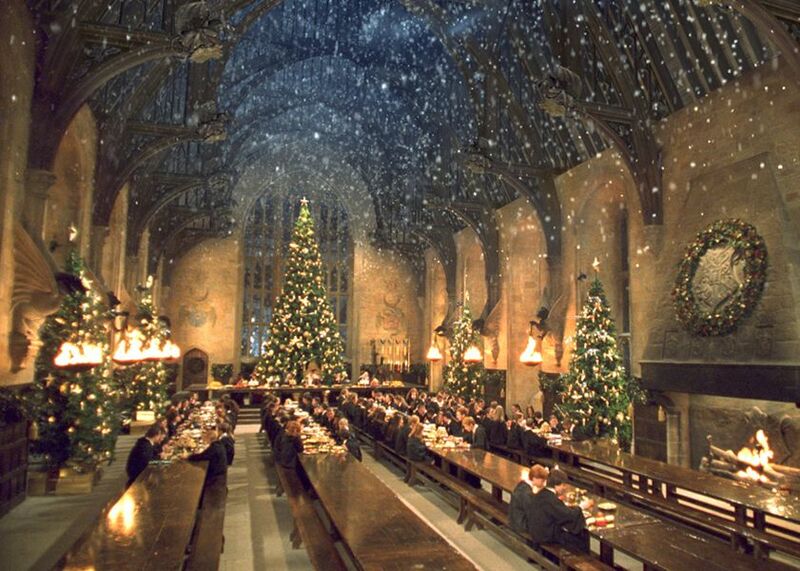 Seeing the Great Hall decorated for the first time with 12 magical Christmas trees ranks right up there with Harry having his best Christmas (away from the Dursleys!) ever. With the gift of the first sweater (jumper in the UK), Harry becomes an adopted member into the Weasley clan. And as George says when telling Percy he has to sit with them at the feast rather than the Prefects, "Christmas is a time for family." Three of these gifts are necessary tools to help Harry figure out the mystery surrounding Nicholas Flamel and the Philosopher's Stone. The invisibility cloak helps Harry sneak around Hogwarts. Flamel is revealed to the Trio through his Chocolate Frog card, and Hagrid's flute helps them get past Fluffy. 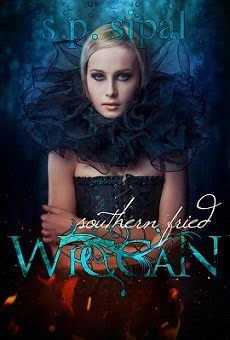 So in reading one of my favorite bloggers early this morning, (thanks Laura! 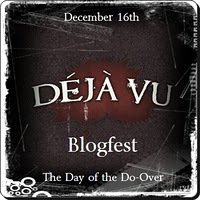 ), I discovered that today is Deja Vu Blogfest. What fun! In looking back over my earlier posts from over a year ago, I decided to revisit this one, because, to be honest, it needed a touch-up. Hope you enjoy a second, improved helping of A Taste of Magic. 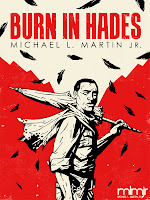 Oh, and please skip over to Wednesday's guest post from fabulous debut author Michael L. Martin, Jr. and post a comment on A Sense of Wonder to win a copy of his book Burn in Hades. Winner will be announced in this space at noon today EST. So hurry! Congratulations Suzanne Lucero! You're the winner of Michael's book Burn in Hades! I hope you enjoy it as much as I did. I'll send you an e-mail about which format. When working with an element unfamiliar to your reader, such as a certain magical spell or fantastical beast, it is important to introduce how your creation works before using it in an important situation, especially a situation that involves a twist or mystery. You have to play fair with your reader by exposing the magical function before the magical result is critical to the story. J.K. Rowling was really good about this. For example, we saw McGonagall transform as an animagus long before the Padfoot, Wormtail, Prongs, and Mooney thread of Prisoner of Azkaban. Likewise, Jo introduced the Polyjuice potion as a relatively minor plot point in Chamber of Secrets before it became a major potion of concealment two books later. In looking at Goblet of Fire, I found two magical elements that JKR deliberately introduced to her reader at the beginning of the story which played a crucial role in its climax: the Portkey and Prior Incantato. Early in the book, Mr. Diggory used Prior Incantato to discover the last spell cast from the wand Winky had been discovered with...Harry's own. Hermione gasped in horror as a shadow of the Dark Mark emerged from Harry's lost wand. When traveling to the Quidditch World Cup, Mr. Weasley tells Harry that the Portkey they are about to take is an object "used to transport wizards from one spot to another at a prearranged time. 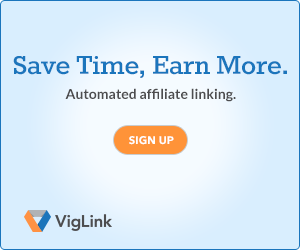 You can do large groups at a time if you need to." And when Harry asks what type of objects they are, he replies, "Well, they can be anything...Unobtrusive things, obviously, so Muggles don't go picking them up and playing with them." (p. 70, GoF). Cross never forgives because he never forgets. Haunted by the Hell of his past transgressions, he sets out on an epic journey across the underworld to paradise--not to frolic in the gardens with the righteous, but to drink from the river Lethe which causes complete forgetfulness. He's a rare soul who remembers his life before death, known throughout the underworld as "The Man Who Remembers". There's a bounty on his memories, and envious spirits hunt his head to steal them. Erasing his mind will get the spirits off his neck and allow him to keep his crown on its throne, but he will have to continue his afterlife in an ignorant bliss. Even more unfortunate for him, paradise is guarded by a great wall that annihilates any soul that gets too close. No member of the damned has ever broken in. Michael's vision is truly epic and his concepts amaze me. Burn in Hades is a story that, like Rowling's, contains layers upon layers of meaning all wrapped within an entertaining story and sandwiched between intriguing characters. I'm so excited about this book, that I could go on and on, but if you'd like to read more, check out my review on Amazon here. Be sure to read the contest info after Michael's post as he's giving away a copy of Burn in Hades! Now, please welcome Michael! Not every story needs to evoke a sense of wonder, but many of us have fallen in love with our most cherished stories because of the awe they’ve struck within our imaginations. Do Your Secondaries Have Lives of Their Own? Harry Potter is all about Harry. He's our hero. He's the Boy Who Lived who is prophesied to defeat He Who Should Not be Named. So everything that happens in a Harry Potter book should be all about him, should in some way contribute directly to his hero's journey...right? And yet, in Rowling's world, many of her characters, aside from her hero, have compelling goals and journeys of their own that only indirectly affect Harry's. 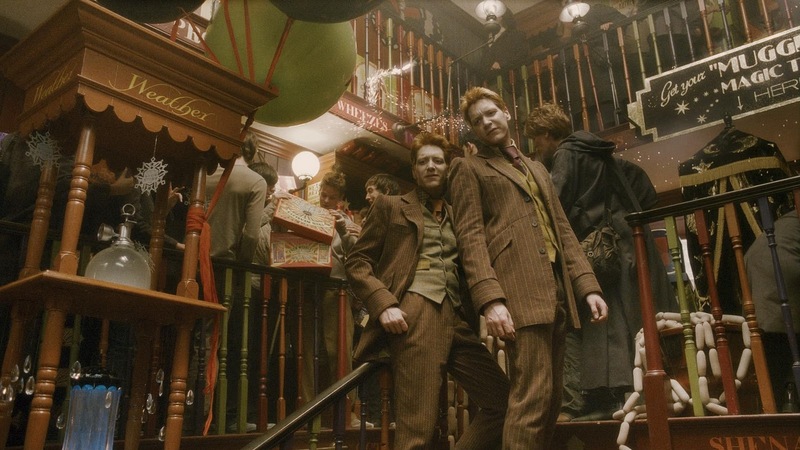 Fred and George's business ventures are a good example. There are points when their goals and Harry's intersect, such as when Harry gives them his Tri-Wizard gold as starter capital, or when they show Harry some of their dark arts defense products -- which Draco later uses against Harry and the Order. But by and large, the twins' joke shop and Harry's quest to end Voldemort are two separate journeys. In Chamber of Secrets, Filch tries to use Kwikspell to improve his magical abilities. Lockhart gives advice to Hagrid on how to keep kelpies out of a well. Percy snogs Penelope in secret. And in Half-Blood Prince, Mrs. Weasley comforts Tonks on her relationship woes with Lupin. 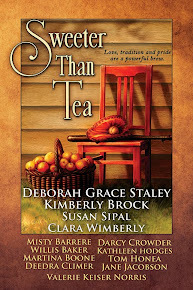 I am thrilled to welcome to the blog today Jami Gold. Whenever I read Jami's blog, I feel that she has written her post just for me. She has such a personal and caring way of writing, and she's always in tune with topics of high interest in writer-land. Her balanced and insightful perspective helps shed new light on any topic, whether it's discussing the advantages between traditional and direct publishing or dissecting a popular movie for plot points. The discussion in her comment trail is often as enlightening as her wonderful posts. And to top it all off, she's a wonderful person who does whatever she can to help out other writers! Today, we're fortunate to have her help navigate the troubled waters of Pottermore. Please join me in welcoming Jami to Harry Potter for Writers, and please also check out her blog and Twitter! This past weekend, the Pottermore Insider reported that Pottermore will be offline for at least a week, and the complaining and gnashing of teeth has been deafening. How is it that one million people can be denied access to an online site for an undetermined length of time and this not be huge news? If Twitter or Facebook were down for even a day, it would be an important story on all the news sites. Instead, the few people talking about the shutdown at Potter-specific websites aren’t making enough noise to carry the story into mainstream media. Why? Because the beta users of Pottermore—the biggest Harry Potter fans—have by and large gotten bored with the site. How Did Fans Turn Into “Enemies”? 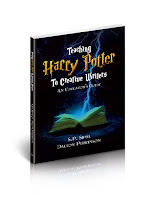 I'm coming to the end of teaching my online workshop, A Writer's Guide to Harry Potter, and as always when I'm wrapping things up, I discover how much I've learned by teaching. Throughout the multiple times I've presented this workshop, the content has grown and deepened as people ask questions that I've not covered. Together, we look for the answers. This new material is then included next time I teach. It's always amazing to me how we all approach the same material from different perspectives. And out of this rich difference will come a variety of interests and questions we seek to explore. As many of you know, I love to delve into the subtext, especially the mythological references. But others are more intrigued with exploring how Rowling used archetypes or built relationships between characters or crafted unique words or a multitude of other aspects, some that I'd not thought enough about to even question. 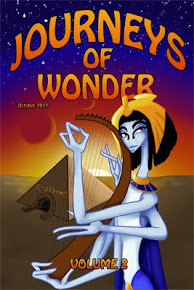 Yes, I'm on an Egyptian mythology roll, because in doing last week's post on Luna as the Eye of Harry/Horus, I discovered quite a few other links JK Rowling made to these old myths. And here's one that seems so obvious to me now, that I don't know why I didn't see it before. When I first started reading the Potter series, I always wondered with each new book why Harry had to return to the dreaded Dursleys each summer. Sure, as a writer I understood Rowling's desire to frame and pattern the story with Harry's annual exodus and return to the Muggle world, but as a reader, I kept wondering why Harry couldn't be allowed to go live with the Weasleys. Of course this was all explained when Dumbledore talked about the spell of protection that he'd used to keep Voldemort from finding and harming Harry as long as he could call #4 Privet Drive his home. A spell that was born of the shared blood between Petunia and Lily.